And that is probably the theme here – . Historical Background – two days before Bob Marley’s Smile Jamaica Concert in December 1976, 3 or 4 gunmen broke into his home and with guns including CIA provided AK 47s and shot at least three people including Marley, his wife and his manager. The Smile Jamaica Concert was scheduled for just before the general elections. The two candidates seeking the office of Prime Minister included Michael Manley from the PNP – People’s National Party -a socialist leaning party and very friendly with Cuba’s Fidel Castro. The other candidate was Edward Seaga, a conservative from the JLP – Jamaica Labour Party – friends of the CIA. The situation had been volatile for a long time and both parties were heavily infused with local neighborhood gang members and activity. Although it is thought that Marley supported the PNP, he was trying to establish peace between the factions by not endorsing any political support. But peace was not to be. The history in the book is spot-on as far as I can tell except for the implication that the CIA had Marley killed, but that’s not really much of the book (and it’s a seriously speculative idea/rumor/urban legend). The story opens with a kind of introductory chapter in which the ghost of Sir Arthur George Jennings is found ruminating on how the dead don’t stop talking and are doomed to observe the kind of mayhem they lived through. The job of these ghosts is to welcome the newly dead to their new situation. Jennings himself was killed when he was pushed off a balcony in Jamaica shortly before the other killings in the book – it was made to look like a suicide but was actually a cover-up for the others. Now he’s doomed to welcome the gang members who were involved in the Marley assassination attempt. Jennings has several first person narratives as several survivor are killed. The point is that this long ago shooting had it’s own ghosts, “long shadows” as some reviewers called them and perhaps more accurately. There were several characters who were hunted down and visited (killed) in New York. This is what’s really happening in Parts 4 and 5 – Part 3 is a kind of transition. And this is where the structure and flow breaks along with my attention – there is a wonderful build-up to the shooting but then starting with the first 3-year jump all the tension went out of the book, now the action was centered – roughly – on finding the shooters and knowledgeable people – retaliation. There were old characters with new issues and some completely new characters only mentioned in passing before. I had to completely readjust myself and trudge on into the new territory of New York and it went on and on before I got my bearings again and saw the connections, In the end it worked but it was not without a chunk of work on my part. Lines and phrases from Bob Marley songs are sprinkled liberally throughout the first half or so but dwindle, as they should, in the last sections. The language is lyrical, breezy and heavily vernacular with no apparent limit on the swearing or graphic descriptions of drug use and violence. Trying to read patois is why I got the audio book (and it has great reviews at Audible). Still, it took several chapters to get past that and I ended up reading as much or more than listening because when I did get the rhythm and the flow I understood why one reviewer called James the Faulkner of the Jamaica. 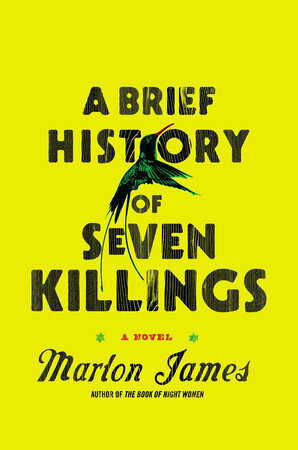 He even went so far as to compare A Brief History of Seven Killings to The Sound and the Fury. I don’t know as I’d go that far, but it’s in the ballpark – As I Lay Dying might be a lot more like it – or Libra by Don DeLillo. There were some places where I wondered where this or that character came from and why they’re there, but James does get around to revealing the connections, so keep reading. Overall I really, really enjoyed this one and I have a feeling we’ll see it on the Booker Short List – (due out in September). LOL I’d rather read vicious than kind of sweet any day!